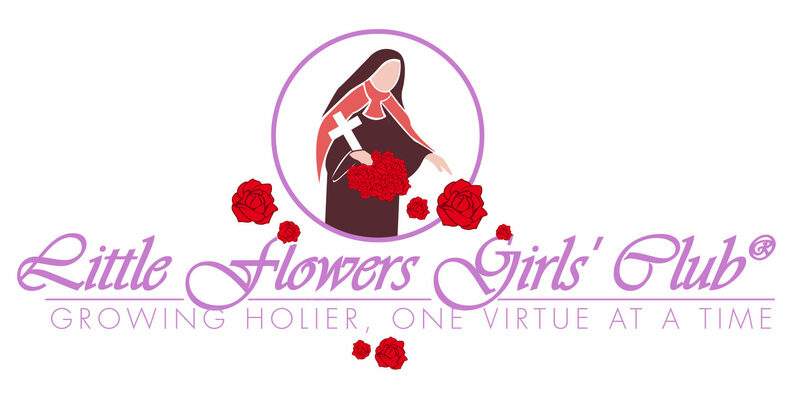 The Little Flowers Girls’ Club is a program that strives to provide young Catholic girls, ages 5 and up, with an opportunity to gather and learn about their Catholic heritage, faith and traditions, as well as other “womanly” traditions that may have faded from view. “Little Flowers” will learn what it means to be a Catholic girl and eventually a Catholic woman. Whether she is called to a life of consecration to Our Lord, a single life or as a wife and mother, she will obtain a strong foundation upon which to build. Each wreath consists of about nine virtues of study. Wreath I includes the virtues of: Faith, Hope, Love of God, Love of Neighbor, Obedience, Humility, Truthfulness, Industry, Piety. Wreath II includes the virtues of: Mercy, Courage, Joy, Generosity, Prudence, Wisdom, Justice, Loyalty, and Perseverance. Wreath III includes the virtues of: Eutrapelia, Friendliness, Initiative, Orderliness, Self-Control, Responsibility, Patience, Cheerfulness, Fortitude. Wreath IV includes the virtues of: A single patch with seven attachable jewels to represent the seven Gifts of the Holy Spirit: Wisdom, Knowledge, Fortitude, Understanding, Counsel, Fear of the Lord, and Piety. Earn one jewel for every completed part of this special wreath and watch your Little Flower grow under the guidance of the Holy Spirit! This is a great opportunity for girls who are preparing for Confirmation to learn about the gifts of the Holy Spirit, to earn badges while completing Christian service ministry, and to participate in a fun Catholic girls’ club. Award the hard work of your Little Flower with a beautiful medal pin ornamented with each virtue’s flower and appropriately coloured ribbon! You can use with each virtue’s medal project or pin them to the sash for a look your Little Flower can be proud of! Each girl will participate in an age-appropriate flower group in our Garden to work on badge activities. Doves: Girls preparing for Confirmation this year as an 8th grader. Doves may opt to do the fourth set of badges, the Crown of Gifts of the Holy Spirit! High School aged girls will have opportunities for leadership and Christian Service within the group as co-leaders and assistants. There will also be opportunities for all of the girls to gather together to socialize at meetings during crafts, snack time, prayer & song time. This process gives girls a month to complete each badge. If you need more time, please feel free to go at your own pace. The goal is to have your daughter learn about the virtue, what it means, and how to live it out in her own faith journey at her specific age level, with your help. Some are very simple and can be done in a few minutes. Others may take a few days over a period of time to work on, say –memorizing a scripture verse. Moms and daughters are encouraged to work on badges together. For example, pg. 11 in your daughter’s member manual, for the virtue of Faith: Find out from your daughter what activities that she did with her garden group back on October 16. If you missed that meeting because you recently joined, just jump right in with the manual, and see what badge activities you would enjoy sharing with your daughter. Any of the other suggested activities from the complete list of ten that you think are appropriate for her age level, abilities, and your family schedule may be done prior to the next meeting. Some are very simple, others are more advanced for older girls. An older sibling, a dad, a grandma, a Confirmation sponsor, or a Godparent are also great role models to assist your daughter with their badge work. Most of them would be proud and honored to do so. Think of the faith sharing opportunities that you can encourage this way! “What does the program manual suggest each for age level/developmental level should be able to do for the badge activities”? Below is a general guideline from the leader manual which gives you a basic idea of what a typical girl could accomplish for each age level. Again these are just suggestions. You know your daughter best. If you daughter can do more or less, that is just fine. Pray with your daughter and ask Jesus what He is calling you to. 8th graders, Dove Group would be able to complete all ten badge activities. Girls preparing for Confirmation this year as an 8th grader will be Doves! The Doves may opt to do the fourth set of badges, the Crown of Gifts of the Holy Spirit! The Little Flowers Girls Club revolves around a four wreath cycle, meeting once per month on the Second Thursday at 6:30pm for girls ages five to 14. Girls may join the club at any time of the year. This is a mother-daughter program. Mothers are encouraged to attend each of our monthly badge meetings. Older teens are encouraged to help serve as leaders and mentors for younger girls in the program. A virtue will be completed every month by means of fun activities, catechesis about a virtue each month, Bible memory verses, games, songs, snacks that share our monthly theme, Christian Service Projects, “Meet a Saint” Movie Nights, field trips and more! A flower petal patch badge is given upon completing a virtue. When a wreath is completed, each girl will be wearing a perfect little flower patch to display on her sash. Religious medals may be earned for special Christian Service projects by the girls. A Mother-Daughter tea party and prayer service will be celebrated in the Summer and certificates of completion will be given to honor the girls’ achievements at the end of the program year. Each month a virtue is emphasized by associating it with a flower, a saint and a scripture verse. The Holy Bible, The Catechism of the Catholic Church, and books about saints and the virtues are all incorporated in the garden meetings. The Little Flowers earn patches which reflect a virtue by doing works of service, praying, memorizing scripture verses and learning about a chosen saint. Songs, crafts, and projects relating to the chosen virtue add to the fun. Within the garden meeting, the girls will hear, read, share, and learn about our role model, the Blessed Virgin Mary, our patroness, St. Therese of Lisieux, saints of the Church, and their own mothers. The Club invites friendships and supports the girls’ Catholic faith. We meet at Ss. Cyril and Methodius Parish on the 3rd Friday of the month at 5:30 PM in the classrooms. No peanut or tree nut products in any snacks due to girls with allergies! STEP ONE Print and complete the Registration and Medical Release Forms. Print and complete the Criminal Background Check Authorization Form. Submit form to the church office for verification. Attend a free Protecting God’s Children session (visit website below). Submit a copy of the certificate to the church office. prior to volunteering, and take the Protecting God’s Children class per Archdiocese of Detroit mandate. If you have already taken the PGC class, submit a copy of your certificate to the office. Bring completed Registration and Medical Release forms and dues to any club meeting. May also be mailed to the attention of Little Flowers Girls’ Club at Ss. Cyril and Methodius Church. Little Flowers Girls Club Dues: $45.00 per year, This covers the cost of craft supplies and materials. Please make check payable to: Ss. Cyril and Methodius Church – LFGC. No child will be turned away from the club do to lack of finances – ALL WELCOME !